Unfortunately, Mother Nature does not punch a timeclock from 9 to 5, and emergency tree service in Daytona Beach can be required anytime, day or night. This is why Daytona Beach Tree Pros is standing by 24/7 in the event that you should ever have a tree emergency that needs to be taken care of right away. A tree that has come down in the wrong place can not only mean it’s a nuisance, but could also produce an extremely unsafe condition. 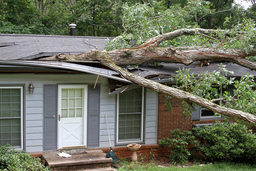 Trees that are resting against your roof or leaning on power lines can do even more harm if not taken care of promptly. Our trained tree professionals are ready to respond quickly anytime that you need emergency tree service. We provide this type of emergency service for both commercial and residential properties. You will be amazed at just how quickly we will work to put things back to order around your home or business once you call us. And our emergency tree removal services are priced competitively, so will never take advantage of you in your time of distress. Some of you might not believe these can all be true tree emergencies, but at Daytona Beach Tree Pros we will certainly attach the proper urgency to a service call if you feel the situation warrants it. When severe storms and hurricanes are on the way it’s better to be proactive to minimize potential damage and to fight through the busy backlog of tree chaos after a big storm has hit. Taking down the right tree before a storm can literally save you thousands of dollars in damage and deductibles. When you live in Florida there are things such as severe storms and hurricanes that become a part of your life. When the wind gets high enough even the healthiest of trees can sometimes not stand up to it; this is especially true if the soil has also become saturated with rain. When storms lean trees precariously or knock them down many times it necessitates their removal. Here at Daytona Beach Tree Pros we have the right people and the right equipment in place to handle your tree emergency both quickly and safely. Unfortunately, many tree companies go as far as doubling or tripling their normal tree emergency pricing after big storms when the demand is high; at Daytona Beach Tree Pros we are proud to say we are not one of them. Whether it’s emergency tree service or regular tree service we always put the customer first and never take advantage of them. We will also be more than happy to provide you with an estimate before we even start the job. We will explain to you exactly how we will do the job and give you a very fair and competitive price for Daytona Beach emergency tree service. True emergency tree service in Daytona Beach, FL does not mean you show up two days after you get the call. We recognize your situation is urgent and we will respond as quickly as conditions dictate. Daytona Beach Tree Pros also has the stand by capability to ratchet up our manpower and resources in the event of a big storm to help our many customers with their needs. If you have a tree emergency in Daytona Beach you will be very pleased with our response and effort. So call Daytona Beach Tree Pros immediately if you need 24/7 emergency tree service in Daytona Beach at 386-267-8220 and we will make every effort to get to your location as quickly as possible to help resolve your problem.